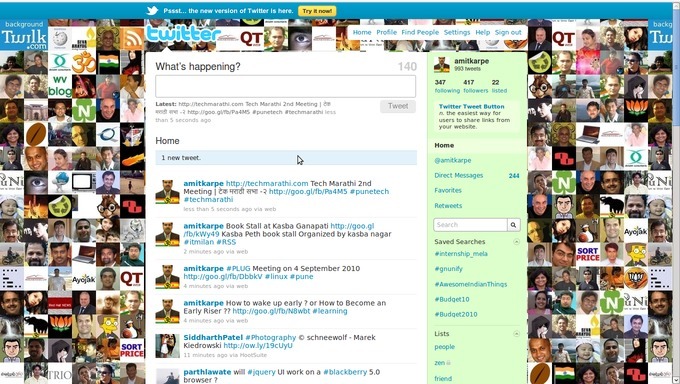 Amit Karpe: I got #NewTwitter or just New Twitter ! I had heard lots of things about New Twitter. Even I had watch news on NDTV or CNN-IBN about New Twitter. Also was watching tending of #NewTwitter on twitter.com But today after I write 3-4 twits ( Early Riser, PLUG Meeting, Book Stall, Tech Marathi ) I found this pop message. Pssst... the new version of Twitter is here. "Try it Now!" My twitter account before NewTwitter! My twitter account confirming for NewTwitter! Here we have a new look, new Twitter !!!! My twitter account after NewTwitter! The new look of twitter is amazing to use it. You just have click to see everything there it self. No need to open profile or any other thing in new tabs. It is fast. You can check all your mentions, retweets, searches, and lists in same tab. There no need for me to use http://brizzly.com/ anymore. You can see all your know features like you’re familiar with, including whom you recently followed and who recently followed you, favorites, and Trending Topics. All your videos, photos and various other formats in same tab, for this feature twitter had did partnership with various companies. Also you can check any profile as mini profile. Without navigating from the page, which provides quick access to account information, including bio and recent Tweets. If you don't like, you can rollback. 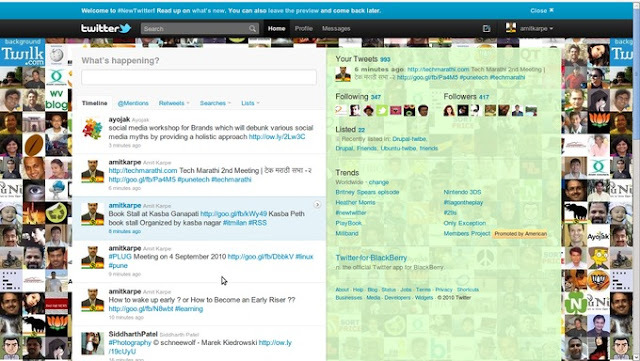 But sooner or latter everyone have to use this new interface with all these new features. Facebook is social networking site and Twitter is knowledge networking site. I still prefer Twitter for information & knowledge. And FaceBook for friends and relatives to keep in touch, more personal touch, more entertain.